Even as the Linac Coherent Light Source delivers X-rays with unprecedented power, marking a new era of X-ray science, a team of SLAC researchers is working to make such X-ray lasers even better. In a paper published yesterday in Physical Review Letters, the "Echo 7" team describes their success at adding an additional, elusive property to such beams: temporal coherence. Free electron lasers like the LCLS create X-rays that are spatially coherent; in other words, the crests and troughs of each light wave at any given moment line up with one another, traveling forward in perfect synchrony. With temporally coherent light, the peaks and valleys at one moment match the peaks and valleys a certain amount of time later. 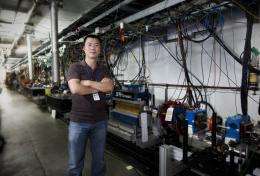 The experiments, which took place between April and July, were based on a theory called Echo-Enabled Harmonic Generation proposed by SLAC accelerator theorist Gennady Stupakov. In EEHG, an electron beam interacts with a "seed" laser that already has temporal and spatial coherence, albeit with a longer wavelength than the researchers ultimately need. Interaction with the seed laser causes the electrons in the beam to pack into bunches in just the right pattern to later generate temporally and spatially coherent X-ray light. The LCLS, in comparison, begins not with a seed laser but with random noise, which leads to spatial but not temporal coherence. At the Next Linear Collider Test Accelerator, located in End Station B, the researchers were able to create a temporally coherent beam with a wavelength a factor of four shorter than its starting wavelength: within the ultraviolet range. Eventually, the team would like to decrease the wavelength to 20 percent that size, creating spatially and temporally coherent extreme ultraviolet light that is stable in space and consistent in time. "This is an important step," said SLAC accelerator physicist Dao Xiang, who led the experiment with help from Michael Dunning and Stephen Weathersby of the Accelerator Research Division Test Facilities Department. "We have demonstrated that EEHG works." The project was funded by the Office of Basic Energy Sciences using the NLCTA, which was built as part of the NLC Linear Collider program funded by the Department of Energy's Office of High Energy Physics. "This experiment was very impressive in terms of both the physics that was measured as well as the speed with which the team put it together," said Accelerator Research Division Director and experiment principal investigator Tor Raubenheimer. "We saw the opportunity, DOE's Office of Basic Energy Sciences supported us, and Dao, Carsten [Hast, manager of the NLCTA facility] and the Test Facilities group made it happen." The team is now working to further validate the theory and create shorter wavelengths of temporally coherent light. In the near future, the researchers want to confirm that this technique could be scaled to the X-ray range. "The NLCTA is a unique test facility for experimental accelerator R&D," said Hast. "We plan to use it to study a lot more fundamental beam physics over the next few years." If future experiments are as successful as this one, EEHG may also be used in LCLS-II to generate fully coherent x-rays that arrive so regularly that they can be synchronized with a laser for pump-probe experiments. With fully coherent X-ray light, researchers at the LCLS could conduct many more challenging ultrahigh resolution microscopy and imaging studies—valuable additions to an already valuable machine.